Times are changing, now in addition to all your buying and selling needs along Ontario's west Coast ( Lake Huron ) I have now added Mortgage Brokerage to my resume and teamed with Mortgage Intelligence to provide Mortgage and Loan services to clients, making what I offer FULL service in buying a home as well as ongoing re-financing opportunities. I can be reached either at 519 238 - 5700 (RE/MAX) or 519 238 - 5899 ( Mortgage Intelligence ) or Toll Free at 877 338 - 5899. If your thinking about Summer Rentals in Grand Bend, Port Franks Ipperwash or Bayfield you better hurry, things are booking fast . 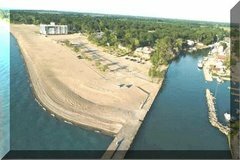 For Rental info go to www.grandbend4sale.com/RentalPage.htm . At my rental, only the 1st 2 weeks of July are available, however wekend packages ( or weekly ) are available for April, May and June. Go to www.grandbend4sale.com/44walker.htm . Posted by Larry Broadley at 7:56 a.m.